This site has been moving toward dormancy for a while now, so let me make it official. It has served as a personal log for me while I was getting to know the ins and outs of the brewing system I put together in the summer of 2013, with the added bonus of broadcasting those notes along with other general brewing advice to the world. At this point I’m very comfortable with the system, and my notes, which tend to be short and predictable, are kept in a spreadsheet I created, which automates things like adjusting for temperature on gravity readings and performing efficiency calculations. In closing, let me make a few general remarks on what I’ve learned about brewing over the course of the last three years of using the small system. Yeast makes beer, so concentrate on the cold side. Almost everything that happens on the hot side of the process is small potatoes in comparison. The 10L system makes brewing much more practical. The ability to use the oven & stove efficiently and to clean the gear in the kitchen sink is massive. When you find a yeast strain or recipe that you really like, use it again and again. It’s easy to over-explore and under-exploit. Write a program / spreadsheet from scratch to calibrate / adjust measurements and perform efficiency calculations. It will give you a better understanding of the brewing process. 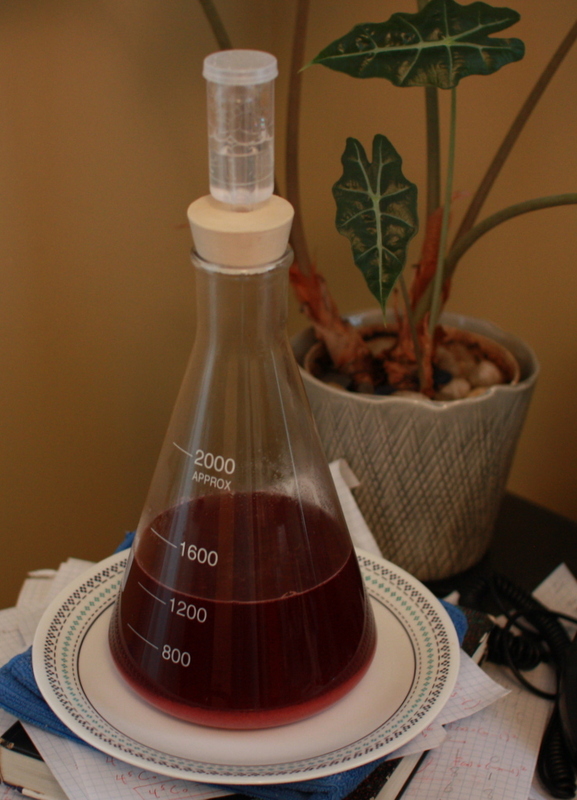 I had a half vial of yeast, some crystal 40L, and a huge two dollar bag of beets lying around. This strange liquid is made using 125g Crystal 40L, which was steeped in 70C water for 15 minutes, to which six peeled and sliced beets were added, along with more water. It was boiled for 15 minutes after throwing in 125g of table sugar. 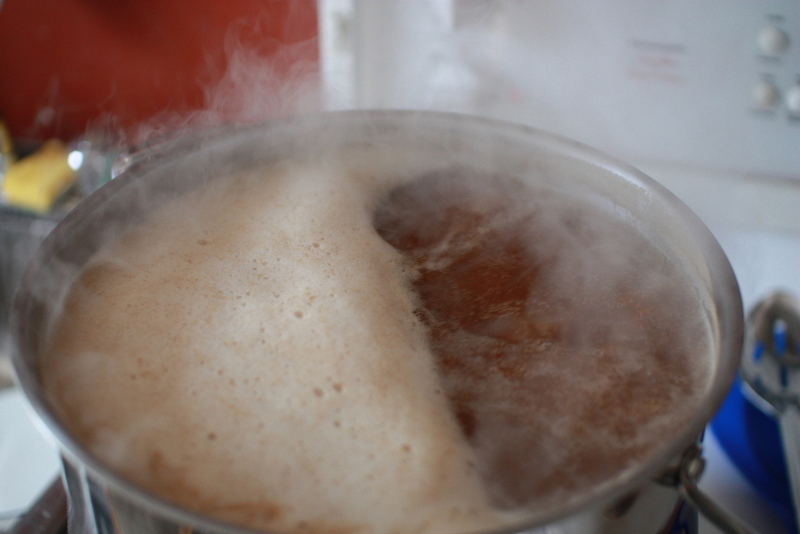 The resulting wort, which measured somewhere around 1.045 OG, was placed into a sanitized Erlenmeyer flask, cooled, and a half vial of Belgian strong ale yeast was pitched. I’m expecting it to yield at least a single 750mL bottle. How will it taste? It will definitely be sweet, but other than that? Only time will tell. In Quebec, the only way to access imported beer from Europe, save for a few macrobrews which make it to deps (corner stores), is through the SAQ, the provincial retailer. This means that the list of great European beers I can get is extremely limited. Saison Dupont for example, which I would name as my ‘desert island’ beer, is not available in Quebec. However, the list of beers that the SAQ chooses to stock does include a few truly spectacular ones, and these sell for a fraction of the price you would pay in the states. One of these is Rochefort 10, which is a real gem. The fact that I can find such a great quad at such a reasonable price begs the question: why make one yourself? Well, it gives me an excuse to experiment with a new process. In this case, brew in a bag. With my standard mash / transfer / fly sparge procedure, I can only use about 2.5 kilos of grain at most, resulting in an OG of around 1.060. This batch used a brew in a bag / batch sparge hybrid procedure with almost double that amount of grain to see what kind of extraction numbers I could get. The idea was to mash as much grain as I could get into my kettle, brew in a bag style, and then remove the grain bag and place it into another vessel filled with sparge water, leave it there for ten minutes, pour the runnings back into the kettle and begin boiling. A ‘double dip’, if you will. 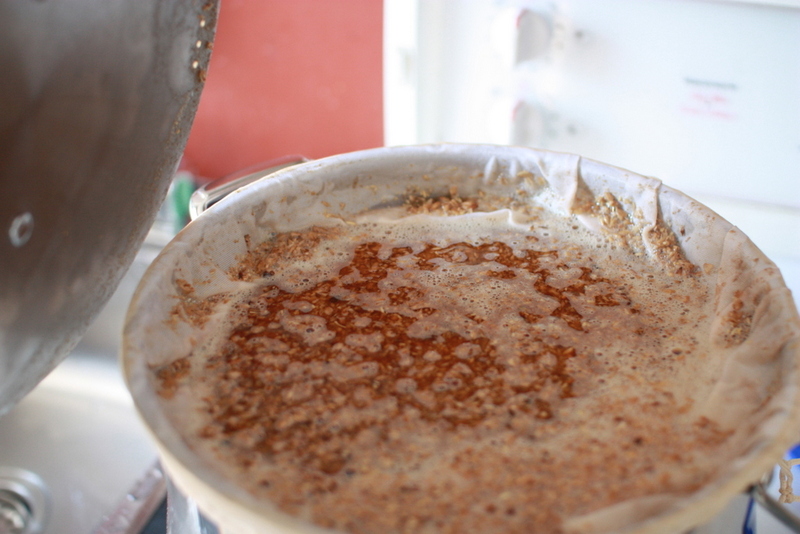 The mash, which used 4.4 kg of grain at 2.4 L/kg, filled my kettle right to capacity as you can see above. The double dip idea was a bit of a disaster, as the vessel with the sparge water in it had a smaller diameter than the kettle, so the grain bag wasn’t so much placed into it as onto it. After making a mess and losing a bunch of runnings it was eventually squished in. Oh well, lesson learned. The rest of the brew day went smoothly, and I made some date syrup (actually more like date broth) to add to the boil along with some simple sugar in the last ten minutes. Just a pile of thinly sliced dates boiled in a bit of water for half an hour. OG ended up at about 1070, dismal efficiency. 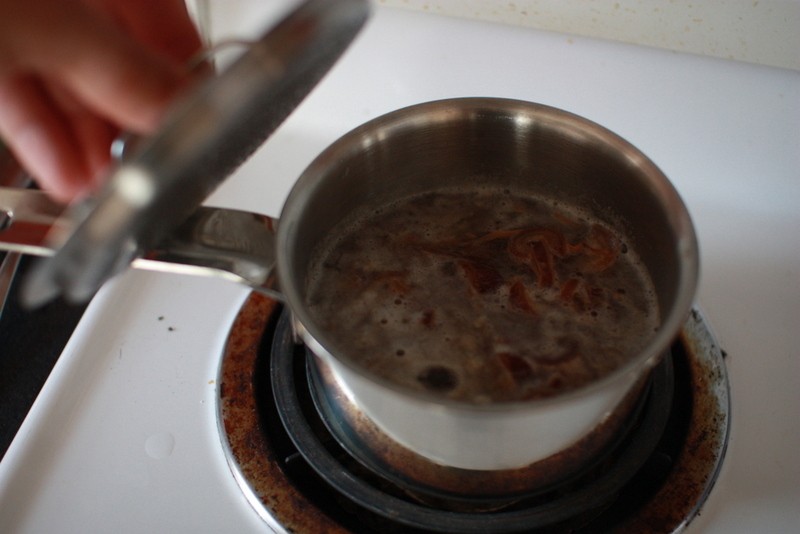 I knew I would lose a lot with this process, but I expect the ‘double dipping’ fiasco had a huge additional efficiency cost since a good deal of the runnings went onto the stove top or into the sink. The upside of the low OG is that I only needed one and a half vials of yeast, so I was able to save a half vial to use for something unusual. 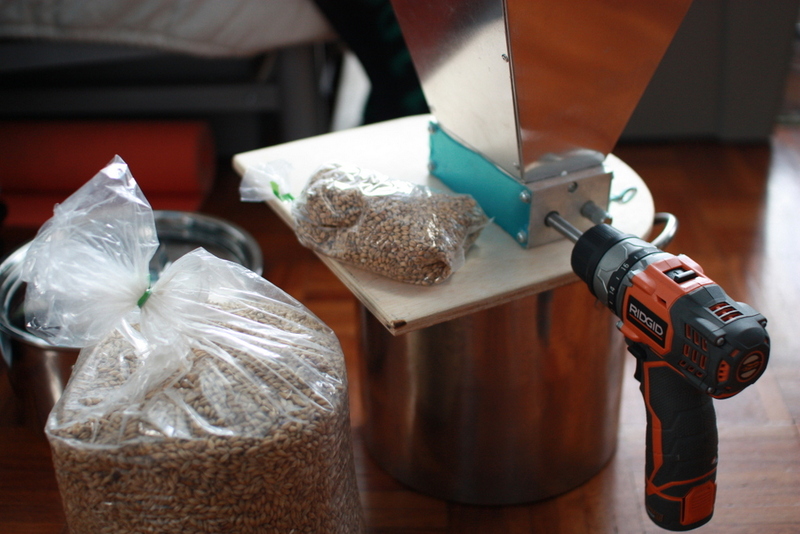 Rest for 70 min at 66.5C, 2.4L/kg, transfer grain bag into 3L of 75C sparge water. 23.09.15: Yeast pitched, temperature at 19.5C. 27.09.15: Temperature to 22.5C gradually over past three days. 30.09.15: Temperature at 22.5C, krausen subsided, slowly ramping down. 08.10.15: Temperature at 21C. Tiny yeast rafts all over the surface. 14.10.15: Bottled 7.5L with 60g of table sugar (3.0 Volumes). Appearance: Golden yellow with dense white head (the photo above has some deceptive white balance). Very good clarity. I have no idea why, but this grain bill seems to clear up really well, despite very cloudy runnings. Smell: Hoppy and sweet. Pine, floral, and citrus/orange are all mixed in there. The dry hop aroma fades quickly over the weeks, so it’s no longer the hop bomb it was initially. Taste: Light and crisp grain flavours provide a background for the hops, which are what it’s all about. Light bodied, dry, and effervescent. No lingering crystal, just a simple bitter and slightly tart finish. Overall: This is exactly the kind of pale ale I want to make. It’s so simple, light bodied and dry that I doubt it would do well in competition, but when it comes to hoppy beer, I like them really dry. Next time, I might add a little something to the grain bill to give it a bit more body, or just mash at a bit higher temperature to try and keep the dryness but add a bit of body. Appearance: Very very dark brown. Dense tan coloured head. Smell: Roasted grain, caramel, and a little bit of chocolate, with essentially no hop aroma. 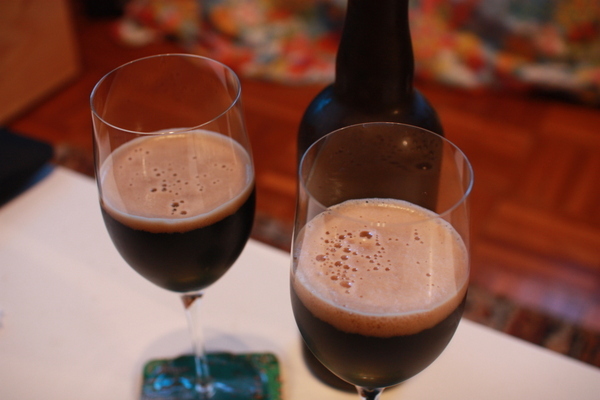 Some dried fruit and molasses/toffee starts to come through once you get closer to the bottom of the glass. I think the 200g of smoked malt is perfect, it’s very subtle. Taste: Just delicious. This one is a bit drier than the last, but other than that, there’s not much change here, clearly the same recipe as the earlier version. Overall: Once again, one of the best Ive made. I’m not sure which iteration I like better, this one or the last. I think that next time, I’ll stick with the ‘two vials, no starter’ approach, and add a bit of lighter crystal into the mix. This winter and spring, I’ve been iterating past recipes and attempting to converge on some ‘regulars’ to be made repeatedly with small variations. Among these are a pale ale, a saison, and a baltic porter. The pale ale is essentially done, in the guise of the Gyle Interrupted APA. The grain bill, yeast, and fermentation profile are set. I’ll throw in whatever fresh and fruity hops are available. The Powrót Maji Baltic Porter is fantasic, and I’ll likely enter it in competition in the fall, but I’ll still play with the recipe. I’d like to sweeten it up a little. I typically prefer very dry beers, but I expect I can make this one more well-rounded and complex with a little lighter crystal. I think it will take a long time to settle on a subtle enough chocolate/crystal/smoked malt balance. The saison recipe is Saison Des Pluies. I love the Dupont yeast strain. There’s something very distinctive in the aroma that’s hard to pin down, and I can’t get enough of it. This is iteration number two of that recipe. A bit bigger than the first, I wanted the OG to land in the low 1050s. The NZ Wakatu hops were unavailable (no surprise there) as well as any form of Golding, so I went with a decent dose of Spalt and Saaz. Not really optimal, but this one isn’t about the hops anyway. The rest of the recipe details are identical to the earlier version. Long low temperature sacc rest with a ten minute dextrinization rest after. Eighty minute boil. Pitch a vial of WLP565 at 18C. For the first two days, keep the fermentation temperature between 18 and 19C, and then begin ramping it up around 3 degrees a day until it hits 27C, stay there for a few days until indications of activity almost totally subside, then start going back down to 22C or so. Rest for 70 min at 64.5C, 3L/kg, raise to 70C for 15min, sparge to 9.5L, top up to 13.3L. 22.04.15: Yeast pitched, temperature at 18.5C. 23.04.15: Airlock active, temperature to 19C. 13.05.15: Bottled 7.9L with 60g of Table Sugar (2.8 volumes). Appearance: Effervescent cloudy copper brown. Very nice head retention. Smell: Malty and sweet are mixed in there, but predominantly phenolic. Not in a good way either, sort of hot, peppery, and medicinal. Taste: Again, very predominantly phenolic. 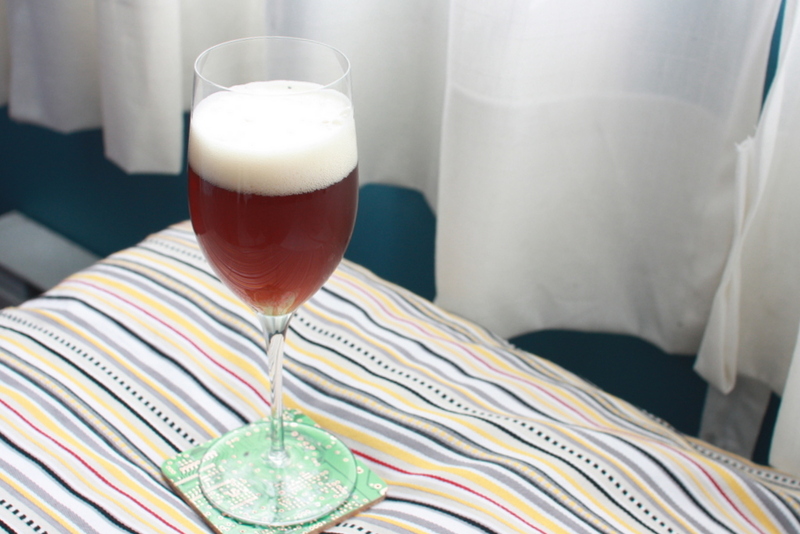 It’s certainly spicy and vaguely clove-like, but really more like an intense rye spiciness. I find it very overwhelming, and the malt flavours really take a back seat. A little on the dry side of balanced, with very nice body given the high level of carbonation. Overall: This is a strange brew indeed, and the first batch which I’m calling a failure and pouring out bottles of. The yeast produced so much sulphur during fermentation and such an intensely phenolic beer. On the upside, the appearance and mouthfeel are great, and there’s a lot of malt flavour in there if you’re looking for it. 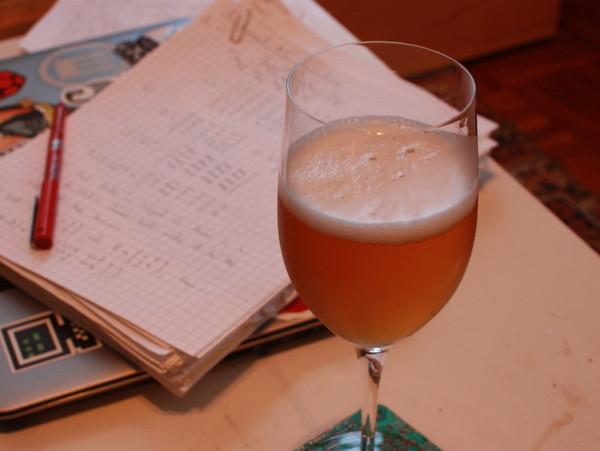 I think the recipe is a good one to redo in the fall, using a more conventional weizen strain like WLP300.